Since the LGBTQIA+ movement is still in its nascent state in the region, so our prime objective is to sensitize the ignorant people regarding the issue and also try to cater to the questions that erupt. 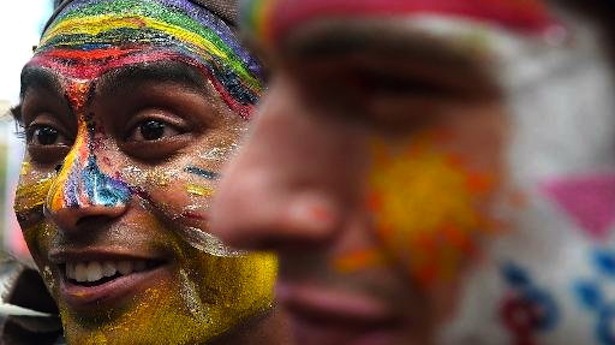 This Sunday (9th of April), the city of Lucknow will host its very first LGBTQI pride walk. Team Gaysi Family caught up with Prakash Das, who volunteers at Awadh, a city based Queer group responsible for organizing the pride march. Q. Tell us a bit about yourself & your role in Awadh Pride Team. I am basically from Assam but pursuing my studies in Banaras. I am a member of Xukia, the only group working exclusively for the LGBT community in the state. As soon as I landed in Uttar Pradesh, I searched for all possible traces of LGBTQIA+ in the region and that’s when I got in touch with these people. Since then, I have been in constant touch, in person and on the virtual world. Regarding my role, well, it’s a little difficult to describe in one word as there has been no strict demarcation and division of work yet. Everyone is just focused on reaching out to as many people as possible. Q. This happens to be Lucknow’s very first pride march, how difficult or easy was it to get official permissions for organizing the march? Being the first pride march in a place like Lucknow and that too right after the election that gave the saffron party the ruling power, it is ironic to say that the BJP played a pivotal role in getting official permissions. However, it is worth mentioning that with Payal Foundation (an NGO for the ‘kinnar’ community) the entire process was almost a cake walk. 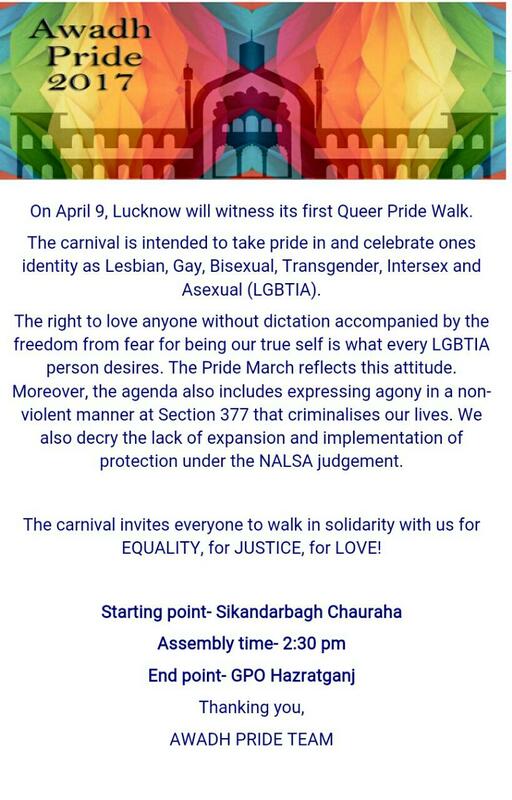 Q. Lucknow is still considered to be a fairly conservative city, how do you plan on encouraging Queer folks and supporters to step out for the march? Yes, organising a pride walk amidst such a regressive surrounding was difficult. The prime hurdle that we encountered was to initially draw out people for planning the event as there were only a handful of people willing to take part. Now we are basically focusing on letting people know through our personal contacts and approaching the cooperative educational institutions that provide us platforms to spread our word. Q. What are the issues/concerns you wish highlight in the march? Since the LGBTQIA+ movement is still in its nascent state in the region, so our prime objective is to sensitize the ignorant people regarding the issue and also try to cater to the questions that erupt. Apart from that, general misogyny and homophobia will also be targeted. We are trying not to bring in any other issue, lest the people get confused and the LGBTQIA+ issue takes the backseat. Q. Any other events planned for this year by Awadh Pride Team? As promotional activities for the pride, we organised a few events. The first one was a small get-together of supportive people for a day dedicated to developing bonds and making posters. The second event was comparatively on a much larger scale as we collaborated with Humsafar Trust of Mumbai for a Queer Film Festival held on 2nd of April. Apart from these, we haven’t concretised any other plan yet. But looking at the response, we are optimistic that the movement will soon gain momentum in this part of the country as well.